The final day of the Individualizing Medicine 2014 Conference kicked off with one of the pioneers of genomics taking the stage. Having founded the Baylor College of Medicine Human Genome Sequencing Center in 1997, Richard Gibbs led one of the five main groups that completed the Human Genome Project. Gibbs discussed his past, present and future work at Baylor, and the impact clinical exome sequencing has had on genetic research. He has been active in Mendelian disease discovery, and discussed the limitations created by lack of sample size. 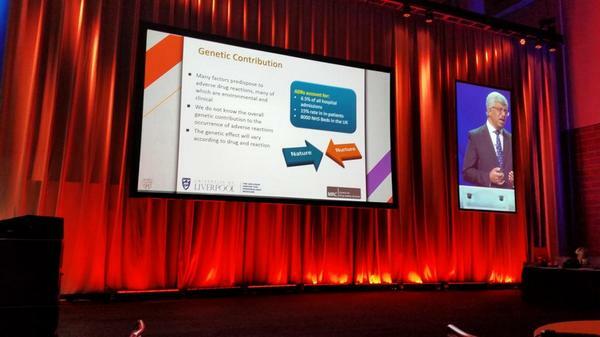 Munir Pirmohamed, M.B., Ch.B., Ph.D., the National Health Service Chair of Pharmacogenetics in the United Kingdom, presents his research on pharmacogenomics at Individualizing Medicine 2014. Pirmohamed’s work in the UK and with the European Commission’s Eu-Pact has covered a broad spectrum of genomics, including work on relating genomics to drug dosing and drug choice. It has also included extensive work with the U.K.’s electronic health records, the European version of electronic medical records. He issued a challenge to the conference audience: it’s critical to enhance and aggregate information on clinical genomics into a database; and we need to turn that data into knowledge. Still excited from her San Francisco Giants winning the National League Division Series, moderator Ceci Connolly used a baseball metaphor for the conference’s final speaker. “Batting cleanup” was Peter Jones, Research Director and Chief Scientific Officer at Van Andel Institute. His talk on the cancer epigenome focused primarily on his discoveries on the effects of 5-azacytidine on DNA methylation. This led Jones to ask the question: how stable is the human epigenome? So, he and his team designed a study with patients who have had their bladders removed and a new bladder surgically inserted. The neobladder study showed the epigenome can change 5 percent a year, and each neobladder adopted a unique epigenome. We are “at the tipping point for epigenetic therapies in cancer,” Jones said. 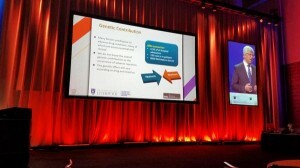 As he has done each day of the conference, Alexander Parker, Associate Director of the Mayo Clinic Center for Individualized Medicine, offered a recap of the day — this time for the entire conference. He left the 750 attendees with a sense of “hope.” But it was “hope” with a twist. “I hope you leave here today upset,” Parker said. “I hope you’re frustrated. I hope you’re really ticked off. And I hope you’re motivated to change things.